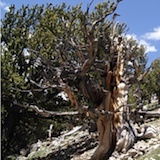 Nevada’s ancient Bristlecones are under attack. Sign Up for our NevadaGram here. 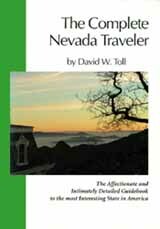 You can order Nevada books online here. 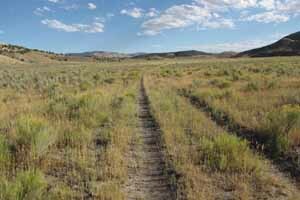 I was pounding the keys upstairs over an Elko barroom, so I missed the trip, but Robin and some friends made a two-day journey on the California Trail that they hugely enjoyed. 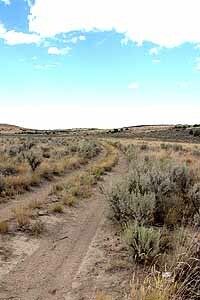 The road through Thousand Springs Valley follows the tracks of the westbound wagon trains. 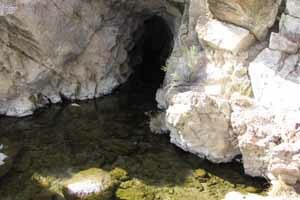 With Wells as the departure point, their route combines a visit to one of Mom Nature’s secret treasures with a glimpse of the pioneer experience, and it ends up in Jackpot, not a bad place to re-enter modern civilization. 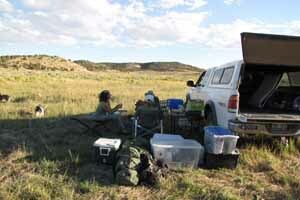 They traveled well-maintained gravel roads that virtually any 2WD vehicle can manage in good weather. They spent two nights on the trail, at first traveling backward — toward the continental divide and Saint Joseph Missouri. 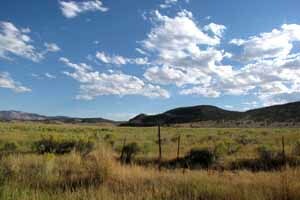 The first night’s camp was dry, in a meadow beside the road north; the second night was on Goose Creek, about ten steps south from the Idaho border. At one point in the journey Robin got a geography lesson by standing between two small, clear streams. One of them ran away to the north where it joined other high desert trickles in finding its way to the Snake, the Columbia and at last into the sea . 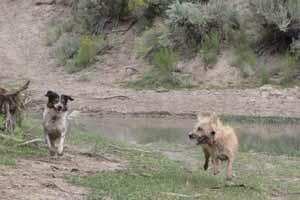 The other meandered south into the Great Basin, flowing eventually into the Humboldt and spreading out behind Rye Patch Dam east of Lovelock. 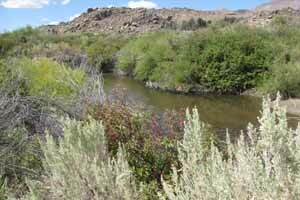 On that high ridge in far northeastern Nevada those streams are no more than 50 feet apart. 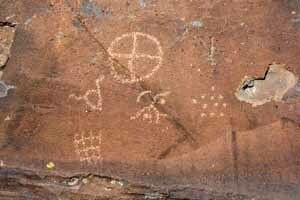 The travelers made a little better time than the covered wagons, but were in no hurry, and stopped often to explore or simply to wonder at the unexpected beauty of this little-known part of Nevada. 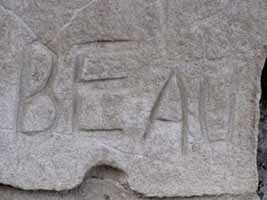 The Trail is well marked, and the excellent “Guide To The California Trail To The Humboldt River” is widely available.. They had the world to themselves. Rock Spring was a lifesaver. The human urge to transcend the moment must be universal. 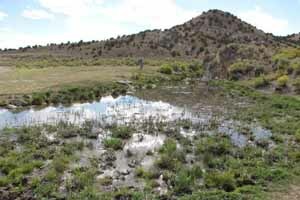 That’s Hot Creek, and the ruts we followed through the sagebrush were made by the iron-shod wheels of the Conestoga wagons. 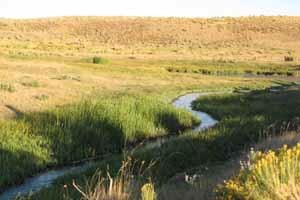 Goose Creek was a major landmark on the trail west. 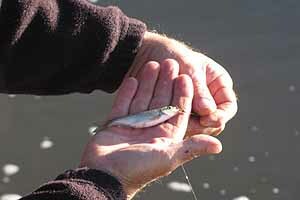 This little guy went back into Salmon Falls Creek as soon as we snapped his photo. The dogs all had a great time, and so did the people. 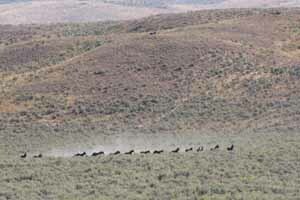 As much as I deplore Virginia City’s Outhouse Races, I am a big fan and supporter of the Virginia City Camel Races. Here are some highlights from this year’s version, provided by an enthusiastic visitor. When Robin and I return home from the northeastern part of the state, we try to get home in daylight so we can unload, start a fire and otherwise reconnect with the mother ship before it’s pitch dark. Which is why we tend to come hurtling westward along I-80 in the late afternoon, when the sunlight comes in low across the landscape. 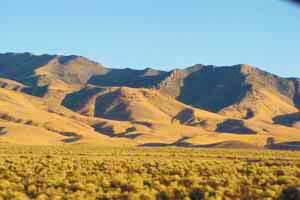 Nowhere, Nevada, in the late light of afternoon. 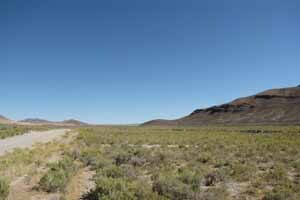 At this time of day, and especially from September through March, the homely stretch of freeway between Lovelock and Fernley is one of the most beautiful parts of the state. The colors are subtle and rich, the textures are subtle and rich, and the effect is . . . rich and not at all subtle. McAvoy Layne invites you to visit the Mark Twain Cultural Center at Incline Village, Lake Tahoe. Liberace with his brother, George, at the Museum shortly after its opening in 1979.
word for it. I’d like to persuade a real photographer to come out here and spend a week taking pictures in these 60 “empty” miles. This is a big part of what I love about living in Nevada: the sudden sense of a different dimension on the verge of discovery . . . when the light comes glancing in just so. I am forever grateful for these little glimpses of the cosmic circus I moved here to join. 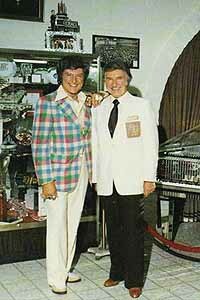 Quick notes from beyond the mountains: Another sign of changing times: The Liberace Museum in Las Vegas is closing; the final day of operation at its East Tropicana street facility will be October 17. In September the Nevada Southern Railway offered a special weekend of train rides beset by bandits. All the shooting was outside the train, but it was quite thrilling and will provide an indelible memory for any kid lucky enough to take the ride. The depot is at 601 Yucca Street in Boulder City; to keep abreast of the railroad’s special events and activities such as the Halloween Train by just send an E-mail. The Nevada Governor’s Conference on Tourismis being revived after a two-year hiatus, scheduled for Tuesday and Wednesday December 7 and 8 at the Peppermill Hotel in Reno . . . 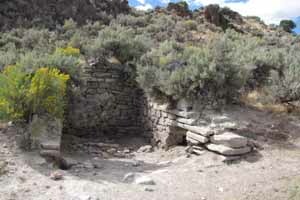 There was an interesting feature published recently in the Las Vegas-Review Journal magazine section CERCA called “The Legacy of the Comstock Lode”. Ordinarily I would link to the article, but lately the LVRJ has taken to suing people who draw attention to their articles on the web. You can check it out by going to their website and then searching for the article by name (don’t say I sent you) . . . If you hunger for news from Wells send Cliff Martine an e-mail and he’ll add you to his notification list . 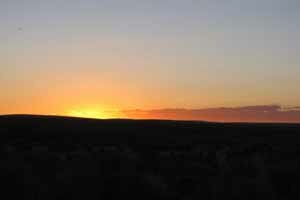 . . Valley of Fire State Park is offering a variety of activities this fall . . . While the Fremont Street Experience was beguiling visitors downtown and the showrooms on the Strip brought great acts from the far ends of the earth to audiences from around the world, an impomptu performance by a 12-foot burmese python drew crowds at Fantastic Indoor Swap Meet on Decatur Boulevard. Tickets to the 27th National Cowboy Poetry Gathering are now on sale to the general public (sales to members opened earlier). If you want one, go here, but go quickly because this is one the the west’s hot tickets . . . Because of the the ongoing drought — 11 years now! — in the Upper Colorado River Basin, Lake Mead is still receding and expected to lose 3 more feet by the end of October, down to 1,082 feet. When the lake is full, its surface is 1,220 feet above sea level. . . . The Lattin Famiy Farm in Fallon will be open its 2010 Corn Maze every Friday and Saturday in October, 5 – 8pm on Fridays and 10am – 8pm on Saturdays, large groups by appointment, closing early on October 30. You can also take a hayride out to the pumpkin patch to find the perfect pumpkin, build your own scarecrow at the Scarecrow Factory, treat the little ones to a cow train ride, or bring some baskets for pick-your-own produce. There are even a few tomatoes left for canning. Visit the website for details (and a $2 discount coupon on Adult admission) and an e-mail link, or call toll free 1-866-638-6293 (local 775-867-3750) for more information. 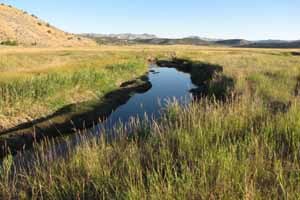 It’s interesting to see how modern and progressive this open-to-the-public farm seems, and yet it’s rooted deep and has emerged out of the traditions and the history of the Lahontan Valley. That’s what makes it such a satisfying place to visit (along with the fine, fresh farm produce, that is, and enjoyable activities like this corn maze) . . . At any given moment there are about 2,000 taxicabs on the streets of Las Vegas. Overheard on the River Walk in Laughlin: The little girl said, ‘I’m glad the sky doesn’t have corners.’ The little boy was about to respond, but a dragonfly caught his attention.